You might have heard about the tragic death of five 15-year-old girls, who wanted to celebrate a birthday in an Escape Room in Poland. Sadly, a fire broke out and all five girls died while the (assumed to be) gamemaster is injured and in the hospital. 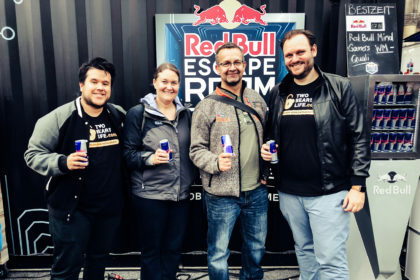 Our friends from Room Escape Artists keep their eyes on the news and update their article about the tragic event regularly – if you want to follow the news, you can find more information here. Reading and talking about this tragic event made me think about the 200 games we have played and certain conversations about room safety we had with some owners, but mostly with our groups afterwards. A tragedy like this makes people reflect and we as an escape room community have to be honest here – we have to be better regarding safety regulations in Escape Rooms. No excuses. Sure, hindsight is always 20/20, but that is not the point. I don’t want to write this to point the finger at certain companies and call them out for certain stuff that did seem fishy to us – we normally do this on sight in conversations. But the question is: shouldn’t we as a community – players, enthusiasts, bloggers and owners – in general care more about room safety? Shouldn’t we call out the black sheep more, to make sure that the industry standards get raised? Do not get me wrong, I am absolutely aware that most owners do care and are doing their best. But being locked in a cage with a padlock and absolutely no emergency exit in sight might seem like a fun experience for an escape room scenario. But what happens in case of fire? Or some other emergency? 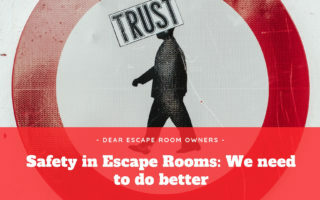 Escape Rooms have to be better prepared, because safety is not just a nice word with expansive repercussions – it is one of the core factors you have to consider when you plan and run a room. Do you want to cut corners to safe a couple of bucks or do you want to make sure that your costumers are safe? Easier said than done, I am absolutely aware of that. 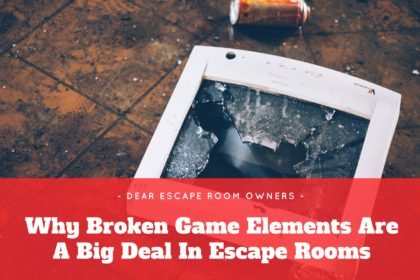 I am not an Escape Room owner, I certainly don’t know how to built a room. Nevertheless, after reading about this tragedy, we have to ask the big and painful question: if you can not afford to open a safe experience, maybe you shouldn’t open one period. Starting this year, our reviews will call out whether or not the company locks players in without an easily accessed emergency exit. We’ve frequently discussed it, but this will become a permanent fixture in our reviews moving forward. We are not in a position to judge compliance with fire safety laws or guidelines, but we can do more to shine a light on companies that are obviously failing in their duties to their players. This is a great idea that we will also try to follow as best as possible. It is an idea that all of us enthusiasts, if you have a blog or not, can do. If you do a room and see security issues, point it out to your host. Ask before you start a game how you can get out and if there is no security exit or plan, refuse to play a game like that. It is time we step up as a community and make sure that we show escape room owners who don’t care: we do not support this kind of business anymore. Clean up your rooms or close them – there is just too much at risk to continue to look away. Since this happened yesterday, we have already talked to a couple of Escape Room company affiliates and it is to be seen how this will effect Poland and the rest of the industry. One think is for sure – a lot of people do care. A lot of businesses are making sure this is not happening to their costumers. But some are not – and this has to stop. In the end, our heart goes out to the girls and their families who lost their lives in this tragic event. There was no reason this should have happened – let’s make sure as a community it doesn’t happen again. What do you think? We would love to hear your thoughts on this matter in the comment section. Hi friends from the players side .. you should review your rankings in regard of compliance with local laws and regulations. 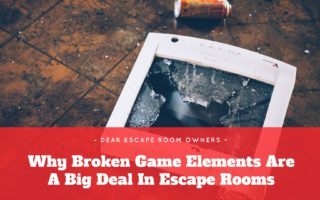 Normally all countries do have high demanding fire protection rules and other requirements which make a normal Escape Game to a professional business. I do run two locations in Germany and one in Spain (Tenerife) and we are just one the way to get the approval of the authorities to start building a third one in Germany. If i look at the race to immersive adventure rooms and totally electronic control and numerous automatic effects i really doubt if this is the right way of judging the quality of rooms. Hi Henning – thanks for your comment. Like we said in the article, we will try to also focus more on safety in our future reviews for the games we have played – absolutely. Since we do travel a lot, it is hard to find out what the local laws and regulations are though .. we can only shine the light on obvious safety problems that we see as players. Is there any better way to evaluate that – how would you like to see it done? 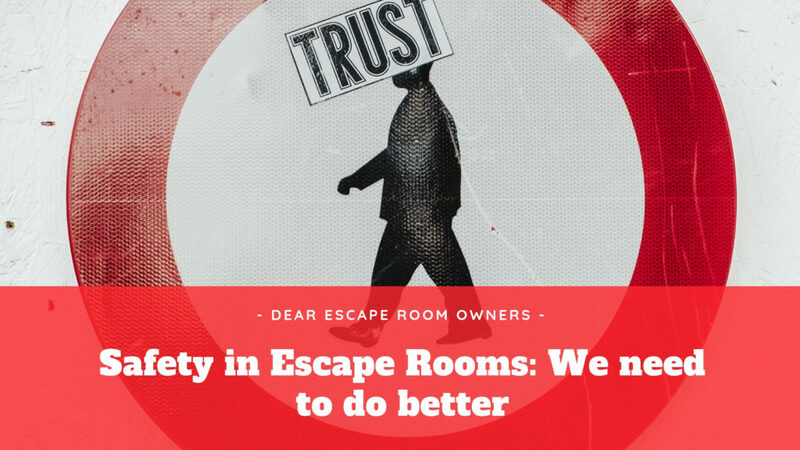 I’ve raised concerns about safety in Escape Rooms before in my blogs too. It appears that these tragic deaths were caused by carbon monoxide asphyxiation, due to a fire in an adjacent room. But I share your concern at “being locked in a cage with a padlock and absolutely no emergency exit in sight”. 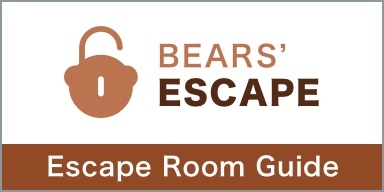 It is good to know that future Room Escape Artist reviews will call out whether or not the company locks players in without an easily accessed emergency exit. Just having the door unlocked is not good enough if players are restrained in other ways. After playing a couple of rooms like that my team have vowed never to play such rooms again. 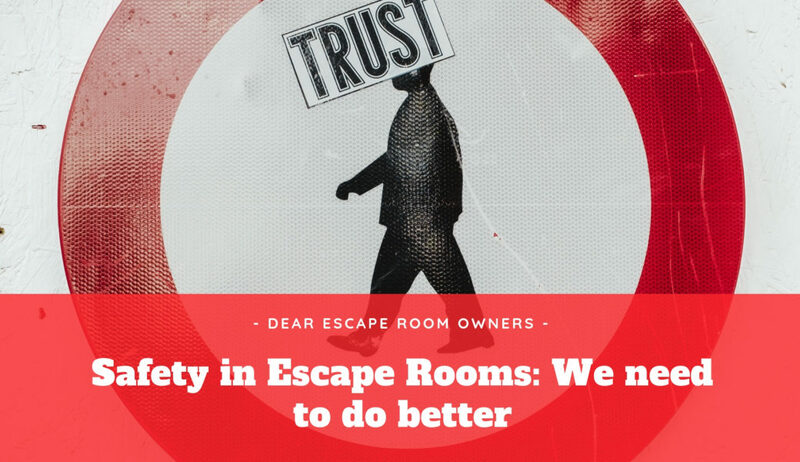 As players none of us are in a position to judge compliance with fire safety laws or guidelines and just have to trust that the Escape room owners have our safety at heart.